Before you plan a trip to anywhere, you’ve got to know “when” to go! Being in a tropical, warm and monsoonal climate, Bali weather and conditions are subject to change from month to month. It is definitely important to check the conditions for before you book your next holiday. Check the Weather Before you Go! Pin to Your Board. Below is a breakdown of Bali weather, with a focus on the main touristy areas of Kuta, Seminyak and the Bukit Peninsula. Ubud exists in a different climate bubble thanks to its elevated and forested location so it’s weather is generally a few degrees cooler. Scroll down or use the navigation on the contents box to link to each month’s specific information. Bali weather is incredibly warm and tropical thanks to its geographical location. It sits at a latitude of 8ºS which puts it adjacent to the equator. These beautiful weather conditions are part of what makes Bali such a huge drawcard for tourists who visit from all around the world. The ocean temperature is pleasant and totally swimmable all year round ranging from 27ºC (81ºF) over the winter months to 29ºC (84ºF) over summer! The ocean is completely free of things like crocodiles and venomous jellyfish that are prevalent in Northern Australia. The only hazard you may find is plastic pollution. Unfortunately the beaches can get a bit dirty depending on which way the trade winds are blowing, and the time of year. 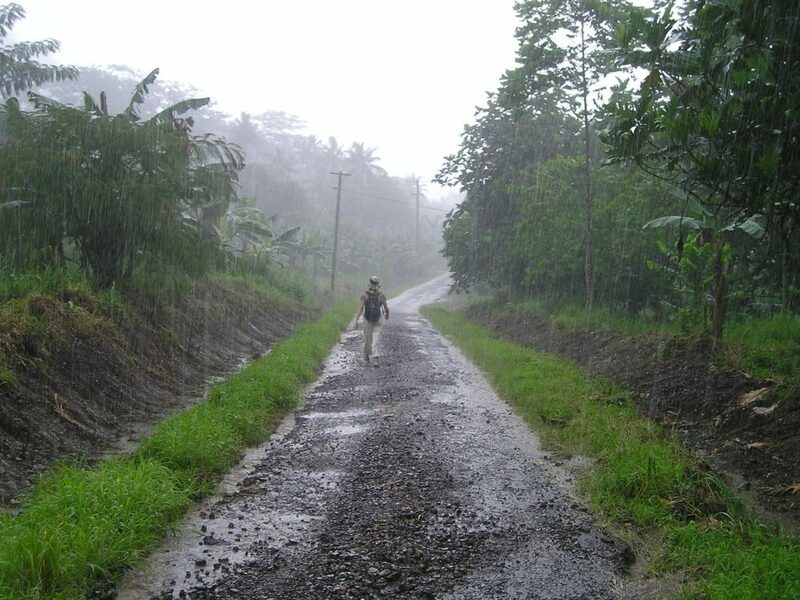 A typical monsoon season affects coastal Bali between November and March. A visit during these months will be generally wet and sweaty with high levels of humidity and rain. Interestingly, Bali’s peak tourist season coincides with the peak monsoon season in December/January as this is when Australians have their long summer holidays. Visitors to Bali in summer will experience heavy rain and big grey clouds. But usually you get a sunny hot morning first, and the showers can tend to pass quickly. Getting caught in a downpour does not mean you get cold and miserable though, thanks to the warm tropical temperatures otherwise. Although December and January is technically known as the rainy monsoon season, visitors to Bali during this time do not seem to mind! They still flock to its’ shores over the festive period to enjoy all that Bali has to offer. In general, for all round mildness and beauty, the best time for Bali weather would have to be any time between May to September. This is when milder temperatures and hardly any rain will allow you to enjoy every day on your holiday. The skies are clear blue and cloudless, the sun is absolutely heavenly and the days are pleasantly warm without being too hot. Bali’s peak periods are Dec/Jan, over Easter in April and between June and August coinciding with the American and European big summer breaks. I prefer to visit between March and May when the numbers of tourists are down, the temperatures are bearable, and the rainy season draws to a close. This is a typical ‘shoulder’ season and is my favourite time of year in Bali. If you are a surfer, you can find waves all year round. 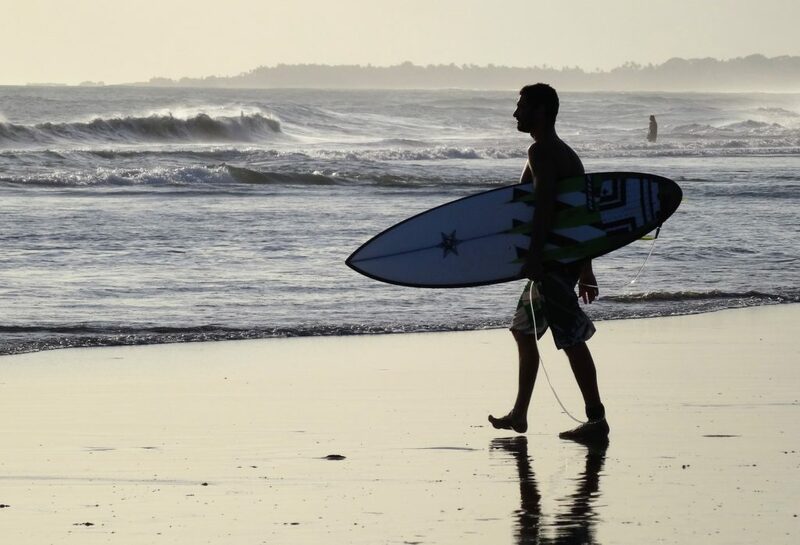 The best most accessible waves are available on the main touristy beaches between May and August. June is probably the best month for surf before it gets crowded in the peak months of July/August/September. If you are staying in Ubud, night time temperatures drop to just over 20ºC which provides a pleasant atmospheric mountain experience. It is just cool enough to snuggle up. The days will still be warm though and will hover around a humid 23ºC to 29ºC. After around the 6th of January, most of the peak tourist numbers start to dwindle so some great deals can be found towards the end of the month. Though you will definitely expect to be subjected to a few tropical showers in January, the days are also a little cooler tending to an average of 26ºC. The wind can affect the southern and western coastlines, which makes beach days and snorkelling less pleasant. Visit in January for temples and market shopping. If you visit the volcanic interior of the island during January you could experience temperatures as low as 10ºC. February is a charming month in Bali and Balinese people are preparing for Nyepi Festival to be held in early March. You will still experience rain on almost every day of the month, but there is a very peaceful atmosphere. Spend your time in Ubud to appreciate ‘real’ Bali in February and care less about rainy beach time. Average temperature: 26ºC. In March you finally feel like the rainy season is coming to an end. If you plan your trip for late March, you may even avoid the rain altogether. The beaches start to clear up, there is less wind and a bit more surf, and the tourists begin to trickle back. March is a pleasant time to be in Bali thanks to Nyepi Day which in 2019 goes from March 7th to 8th. Average temperature warms up slightly to 26.5ºC and there is a feeling of optimism and changing seasons after a long monsoon passes. April marks the official start of the Dry Season in Bali, however like all tropical destinations, it CAN still rain in the dry season! 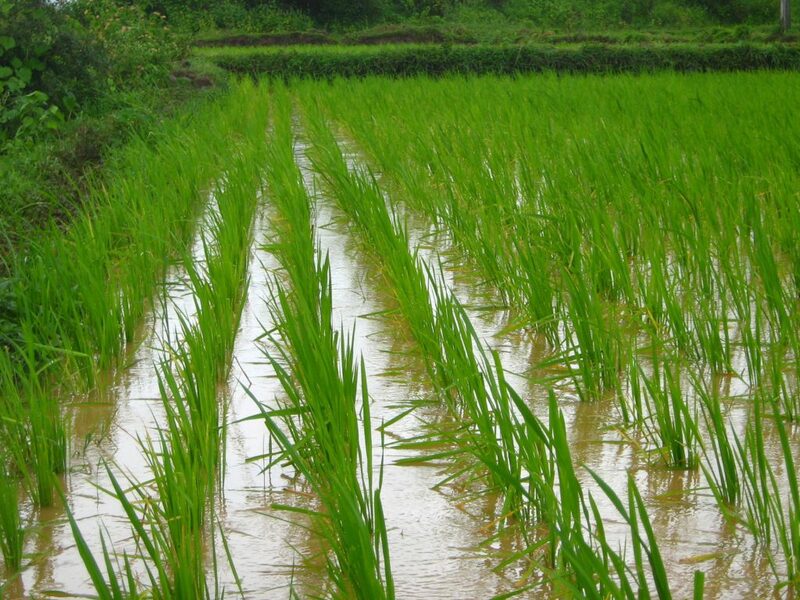 Monsoons can run late or early though April does tend to be the first mostly dry month of the year so far. The peak holiday time of Easter occurs in April which makes accommodation prices increase and popular places even more busy. In 2019 Good Friday is on April 17th. There are usually more sunny days than rainy, the beaches clear up nicely and the blue skies abound. Average temps are around 27ºC. May is my favourite time to be in Bali with average daily temps of 28ºC, hardly any rainfall, off-peak prices and not many tourists. The weather and the atmosphere in May is perfect. Average temp in June is an enjoyable 26.5ºC. Dry season, peak season, holiday season! Everybody hits the awesome beach clubs and top DJs fly in from all over the world to play. The number of international tourists peaks and as such accommodation prices climb as well. The average temp sits around 26ºC. To get a table at the Rock Bar, Uluwatu, in July, book here about a year in advance! Busy, sunny, high season, expect to pay more for accommodation in the second half of June, July and August. Hardly any rain and pleasant temps make this a busy but fun and eventful time of year to visit. Average temp in August is a wonderfully mild 26.5ºC. In September the rain slowly starts up again. It is almost a relief though as after a dry few months the island is looking less lush and the rivers are almost running dry. The prices for accommodation come back down to normal and the massive numbers of tourists dwindle away. A very nice chill time to visit Bali with temps of 26ºC. In general, Bali weather in October is a bit of both worlds with it often raining on half of October’s 31 days. The prices are affordable because it is low season and the temps sit around 27ºC. If you visit Bali in November be prepared for a fair amount of rain, and a very quiet holiday with temps around 27ºC. But hey, at least you will get a table! You will get a lot of rainy days in December. This can mean anything from short sharp showers, to heavy raining for days and days on end! But it is still a great month to visit! Christmas and NYE parties draw big crowds and famous musicians and DJs abound. Windy conditions blow plenty of rubbish on the shores between Kuta and Canggu and rough seas make boat trips nice and hairy with low visibility for snorkelling and diving. But despite this, with its mild 26ºC temperature average and exciting party atmosphere, December is a very popular month to visit. The weather can play a huge role in your decision on when to take a family holiday, and it definitely is something you need to be aware of. It depends on what you are looking to gain from your Bali trip. If you are hoping to lay poolside and work on your tan (while being sun smart of course) then visit in May to September. This will mean you are part of the busy/expensive/touristy vibe that will come with the peak period from July onwards. Christmas and New Years is fun if that party scene is what you are looking for, and the rain will not dampen your spirit! For our family, March/April/May are our favourite low season times to visit. You may get a little rain, but the lower number of tourists make your days perfectly pleasant. Stay abreast of all the new Bali content coming up by subscribing to our newsletter and following us on Facebook. When are you going to Bali? Bali looks like such an interesting place to visit . I never realized that the ocean there was so warm all year. I have only experienced warm oceans in Florida and Hawaii and loved it. Besides Hawaii , Bali is now on my wish list and thanks to your research I can tell when to miss the humid rainy season. Awesome article and lots of info thank you. Hi Cathy, yes Hawaii is another one of my favourites! Bali is definitely a special place and very much worth a visit. Hello Kris! Thanks for emphasizing on how important it is to check weather condition before embarking on any trip, especially when traveling for vacation. Your review on Bali weather and your descriptive analysis of the whole place is making me right now to consider the place as the next place of vacation. You are right about the weather playing a significant role in vacating there. From your well-cut pictures truly it is best to visit from May to September.Thanks for your review of Bali, it will certainly be great vacating there. Fantastic, it is certainly worth visiting! I must tell you I have been reading a good number of your blogs but I have no idea how to post a response over there, so I’ll tell you now how good you are at describing the stuff you are good at. Hey, thank you so much! I hope to keep you informed! Is there anything you would like to know more about? Bali is super safe and super friendly and the mild weather makes it a great choice for a holiday! The weather in Bali sounds perfect any time of the year. I have been in areas where extremes of heat and cold are the norm and a place like Bali sounds like a dream. The many activities that are available there are the icing on the cake, and the prices are reasonable as well. I have been to areas that lie within that latitude and enjoyed the time and weather, so know what to expect when I get to Bali. It is something that is definitely on my ‘to-do’ list, and I hope to get there within the next year. Reading through your detailed post gives me more incentive to book it soon! Based on your breakdown of weather conditions by month, I believe the best time will be in April or May. That is the timeframe I am planning for at the moment. I am glad I came across this post to figure out when the best times are, you have saved me from any disappointment. Thanks for a useful post! Great to hear Dave, yes May is my favourite time to visit Bali too! 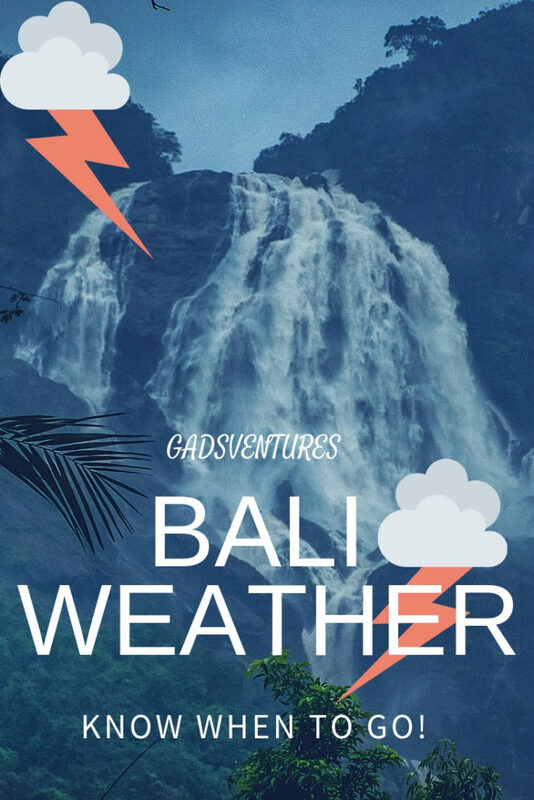 Hi Gadsventure, I really enjoyed reading all your articles and posts about Bali and the weather in Bali. I can definitely agree that choosing the right weather to vacation in certainly helps your overall happiness on your trip. I travelled to Disney World in Orlando, Florida a few years ago and we went in October which isn’t as sweaty hot as the summer season, but it also isn’t as cool as the winter season either. It wasn’t my personal cup of tea, but those who were attending the trip with me who had previously gone to that area before said the weather in summer was much too hot for anyone to be in a pleasant mood and still enjoy the trip. I would have enjoyed the hotter season more, but walking around the parks at Disney, I probably wouldn’t have been such a happy camper in weather that is sunburn inducing. Definitely agreed, weather plays a huge role in a vacation. I have never been to Bali but, one point I really loved in your article is that Bali waters don’t have crocodiles like other tropical regions. I personally was not a fan and was frankly terrified of sharks, crocodiles, and the likes while I was in Florida. I refused to swim in fact, because my sister actually did get stung by a jellyfish while swimming in the ocean. I’m not sure if it would be of interest to the rest of your readers but I know I am always interested in learning about new cultures etc… I was wondering what the Nyepi Festival is exactly? I know your website niche is specifically the weather in Bali however, I think incorporating certain festivals or cultural activities which are native to Bali might be of interest to readers who are thinking of vacationing in Bali. I would definitely be interested in taking a vacation there now that I know there isn’t as many, if any, scary deadly creatures lurking in Bali waters. I would also be super interested in learning what foods and other things are part of peoples lives in Bali. It looks like a beautiful tropical place to take a relaxing vacation. I just might have to check it out one day! Hi Cal, yeah we are from Northern Australia where there is unfortunately heaps of dangerous creatures lurking around the water haha so i love that fact that there is no such thing in Bali too! We will be spending some serious time in Bali in the coming months so stay tuned and follow us on FACEBOOK for all the new articles about Bali. Thank you for taking the time to read the info! I am glad it has helped! Have you been to Bali before?